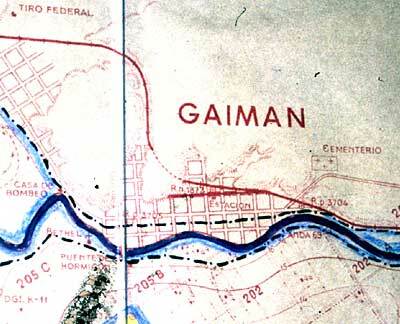 As a previous page suggests, there were early proposals to extend the line, both westwards to Gaiman and beyond and southeast to Rawson on the coast. The failure of the English Bank of the River Plate had however, curtailed the investment abilities of the Argentine Southern Land Company, and thus delayed such ideas. By Law 3882 of 1899 and subsequent decrees the railway company was given powers to lengthen its route, but owing to the big floods in 1899 no work was begun. Their plans were eventually approved by the Ministry of Public Works in August 1901 and work began in 1902, only to be delayed by yet more floods. Gaiman had been severely hit by these periods of flooding, and Rawson almost totally destroyed, whilst the irrigation canals were rendered unusable. In 1906 the ownership of the company had been transferred to the new Port Madryn 'Land' (Argentina) Company. The new board seem to have reviewed the needs of the railway and the opinions of local people and a number of innovations date from this time. These included the purchase of two new locos, and more open wagons, the provision of new warehouses, and the construction of the new muelle. This is the piling rig supplied by messrs. Ransomes & Rapier of Ipswich, England, to facilitate the building of Puerto Madryn's new muelle (1). 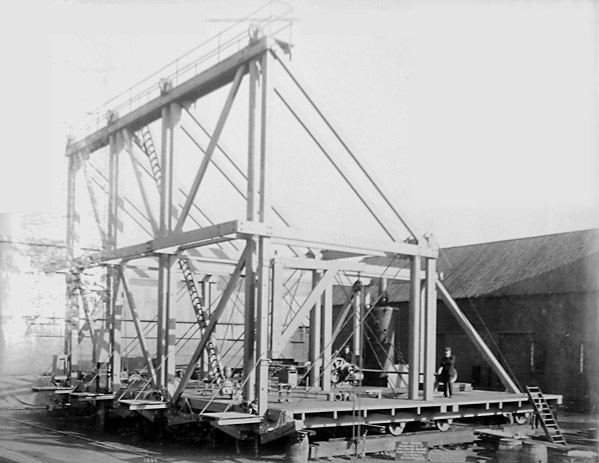 A single donkey engine can drive a line of four piles simultaneously, before moving forward along the length of the muelle to drive the next four. Also resulting from this was the resumption of work on the extension to Gaiman. This new track was laid with second-hand 65lb rail (32.25kg. 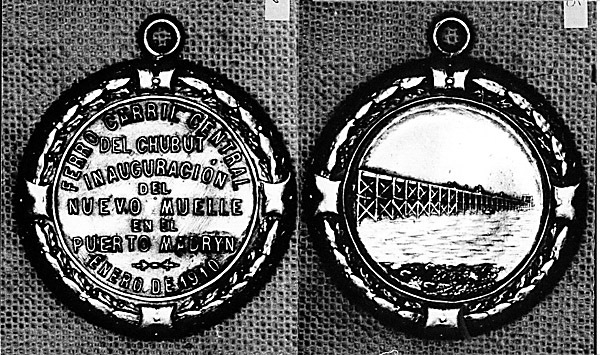 per m.) from the Buenos Ayres & Rosario Rly. The sleepers were now wooden and in fact a law of 1907 (the 'Mitre' law) required the use of native quebracho wood. There were 1300 sleepers per kilometre (2) or 1400 (3). The opening day was 9th February 1909. It was recorded later that Gaiman had a 300m. long loop and 260m. of sidings (3). 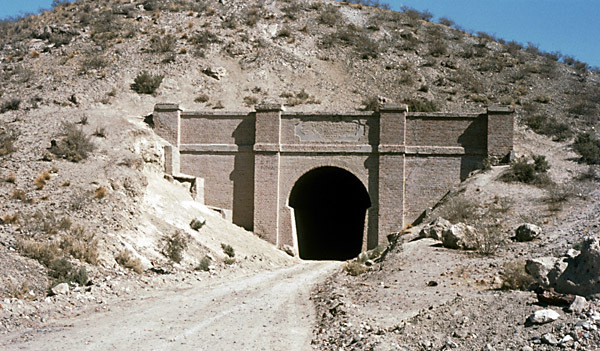 The opening was also notable as the finale of the career in Patagonia of Edward Jones Williams, He had been the initial surveyor of the railway, had managed some of the construction and had remained as General Manager from 1890 until 1907, but was now returning to Britain for family reasons (5). His successors were Mr. Berry, the railway's accountant, and then Senor C. T. Alt who remained as manager until the state takeover in 1922, and as the owners' representative for some time after that. 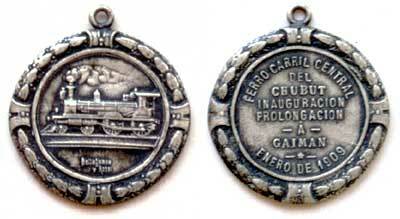 The extension to Gaiman was commemorated, as on previous openings, by the issue of a medal. This one is in Gaiman Museum whose then curator, the late Miss Tegai Roberts, kindly allowed it to be copied. Note the 4-4-0 loco, unlike anything the FCCC possessed, and the January date which was not quite achieved! 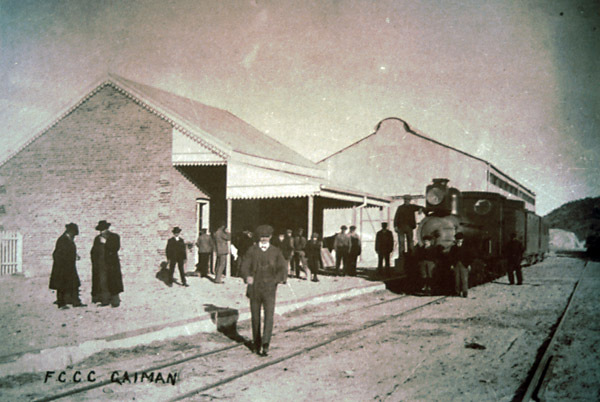 This photo, looking west, clearly shows the station building on the left and the goods shed, behind the train. The loco is one of the later 2-6-0s, no. 4, 5, or 6. The straightness of the platform road suggests that the picture was taken before 1915 when the further extension to Dolavon required the track to be realigned. On the other hand, Gaiman did not have a triangle so did the loco come up the line tender first? From the same angle but from higher back on the hillside, this next photo also shows the station, distant right, with a down train in the platform. The track runs from top right to bottom left across the picture - heading towards Trelew. 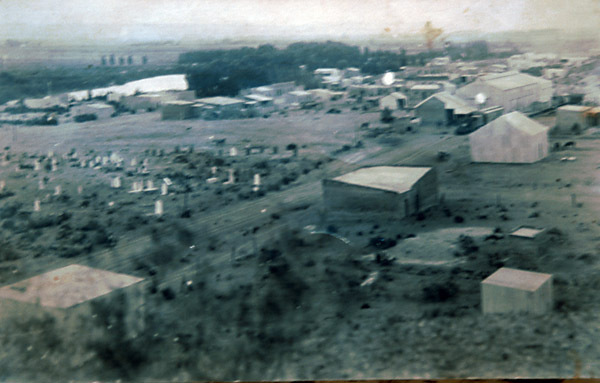 The old cemetery, later replaced, is on the left beyond the track. This had caused some difficulty in the surveying, not least because E. J. Williams' own father was buried there. 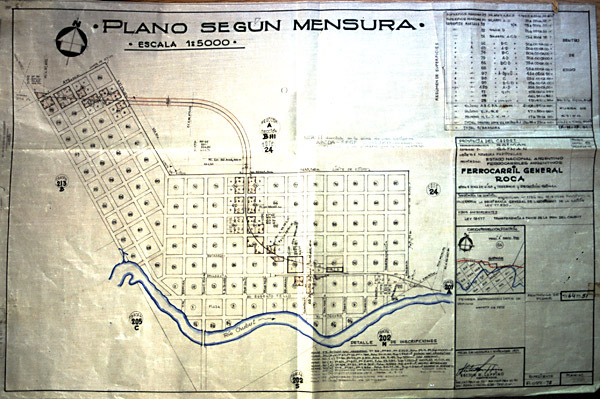 This extract from a land-holding or 'chacra' map, shows how the line originally came in from Trelew (right) and terminated along the line of the street. However the later extension to Dolavon required that the curve into the new tunnel begin east of the station building (though maybe not as far east as this suggests). A map from the FC Gral. Roca period shows much the same arrangement, though without the siding on the original straight station alignment. It is intriguing to see that the land-holdings continue over the hill, though in fact nothing has ever been built above the tunnel. In 1908 the company had applied to Congress for an extension all the way to Paso de Indios, almost 200 miles west of Trelew. The suggestion was that the government should pay a subsidy of 25,000 gold pesos (=about £5,000) per kilometre, should guarantee 5% interest and 1% amortization and in return would take over the line after 20 years. The proposal was rejected (6), although the company seems to have been persistent and was still optimistic in 1910 (7). This proposal will have owed something to the increasing national debate about opening up Patagonia, a debate that was by this date already leading to proposals that there should be a pump-priming network of broad gauge 'Ferrocarriles de Fomento' as explained in the next chapter. Despite the disappointment the railway was prepared to continue westward using its own resources. 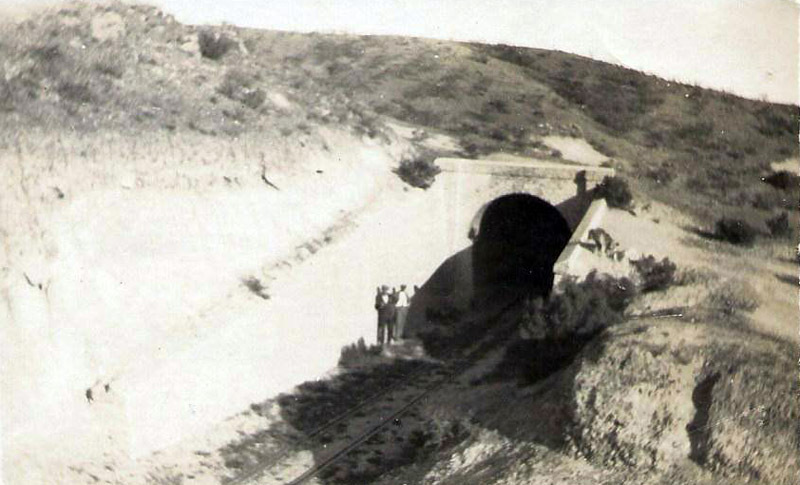 In October 1911 somewhat prematurely it was announced that the line was to be extended towards Boca de la Zanja. This may have owed something to the pressure being applied by the Chubut settlers, who had never had particularly good relations with the FCCC, considering them to be far more concerned with their own profits than with the good of the colony. In 1913 this pressure reached its peak when the Cía. 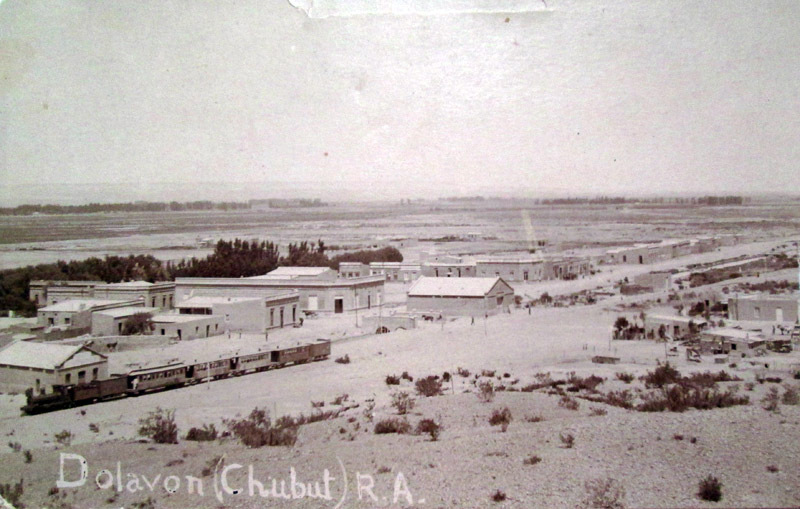 Mercantil del Chubut, a co-operative of local farmers) applied for a concession to build a competing railway from the mouth of the Chubut near Rawson 100km to 'Toma' de la Zanja (8). Work began in July 1914 and by November of the following year 12 miles (19km) to what later became known as Dolavon was opened. The extension involved the cutting of a 282 metre tunnel just west of Gaiman Station. This was the only way to get out of Gaiman for all flatter land west of the station had already been built on. The tunnel is brick lined and was in good condition when inspected in 1975 and in 2000. It was built by Welsh miners brought over from the South Wales coal fields. Apparently many deserted the job and it is said that Polish workers were imported to replace them! (9) This extension continued the use of wooden sleepers but this time the second-hand rails, of 58lb. per yard (28.8kg. per m.), came from the Buenos Ayres Great Southern Railway (10). 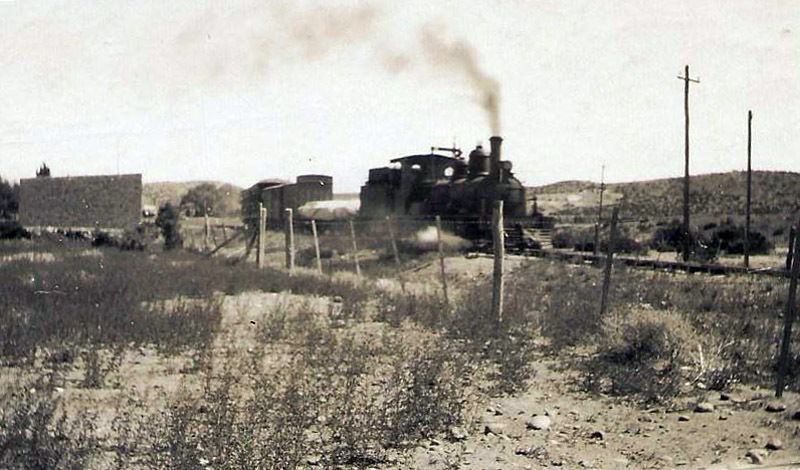 An unidentified loco brings a train back into Gaiman from Dolavon. This was a complaint about the time table. When analysed, it is found that there were no trains at all, not surprisingly, on Sundays, but also on Thursdays, with only a solitary one on Saturdays. 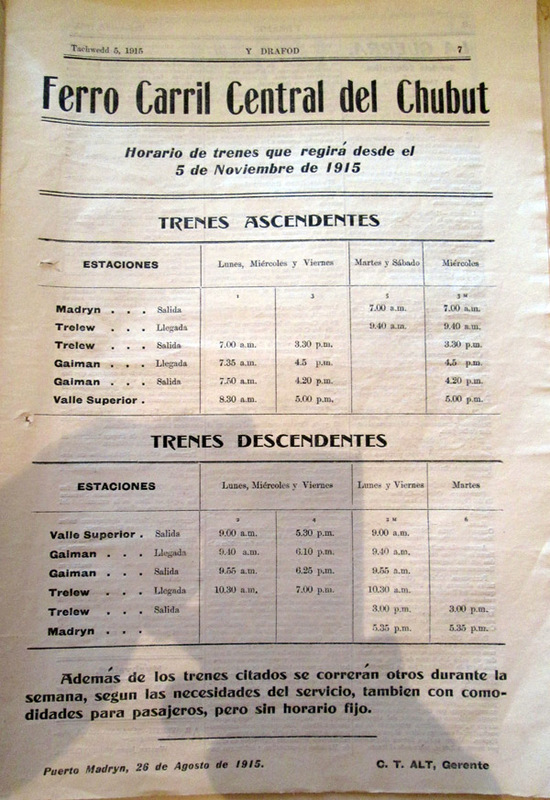 The Trelew to Madryn and Trelew to Valle Superior (ie Dolavon) sections were timetabled with no planned connections. The poem is available in an appendix. This was the timetable as published in Y Drafod, the Welsh language newspaper of the colony. 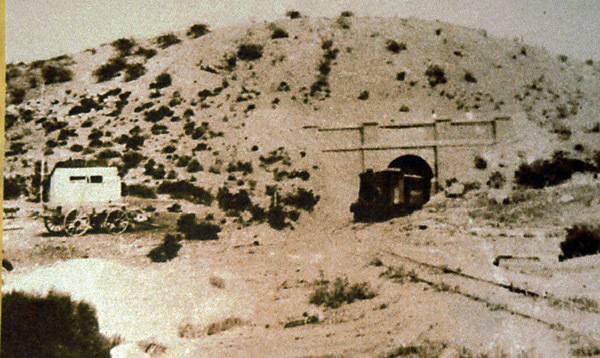 This view shows a mixed train to Valle Superior approaching the tunnel at Gaiman. The leading coach is the short composite coach (No 21) dating from 1915. The 1922 inventory records Valle Superior (Dolavon) as having a 250m. loop line, and 250m. of sidings (3). By the time of the First World War it becomes apparent that the Argentine government was taking a greater interest in the development of Patagonia as a whole, and that big schemes were afoot into which the FCCC would have to fit. These plans are detailed in the following chapter. With hindsight it seems likely that the extraordinary delays in granting a concession to extend to Paso de Indios were intentional, and designed to leave the field free for traffic to use the slowly growing state railways network. A mixed is seen leaving a station, while we are not totally sure of the location, we think that it may be Dolavon. Interestingly above the cab roof may be seen the arm of a signal. The line was originally not provided with home signals and the only other one we know of is at the entrance to Trelew coming from the Madryn direction. Two surfacemen wait at the mouth of the Gaiman tunnel. At this time the track is mixed gauge, using four rails to keep both trains in the centre of the tunnel. 1 Photo used by courtesy of the Suffolk Record Office, Ipswich, England, reference number HC427:8479. 2 Information on rail weights and sleepers provided by S. Damus, from FCE appendices. 3 1922 inventory recorded in The Review of the River Plate, August 18 1922, page 421. 4 Press cuttings quoted at Trelew town website at <www.trelew.com/> in the history pages. 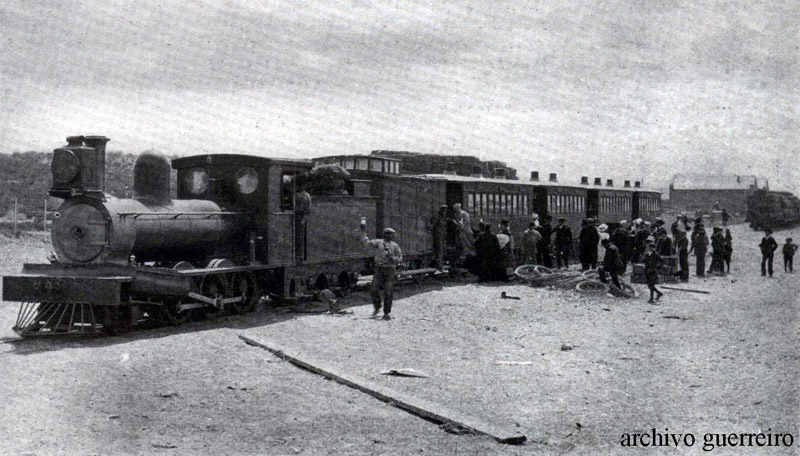 5 El Ferrocarril Central del Chubut. 1993. C. I. Dumrauf. Centro de Estudios Historicos y Sociales, Puerto Madryn. 6 South American Journal, 8 August 1908 p146, and 19 September 1908, p302. 8 Reports in The Review of the River Plate September 26 1913 p795, and October 16 1913 p927. 9 Anecdote reported during my visit in 1975. 10 Historia de los Ferrocarriles Argentinos. 1947. Ferrocarriles del Estado, Argentina. References in this list not otherwise credited were supplied by Sylvester Damus, to whom I am very grateful. 11 Found by Héctor Guerreiro in the book Twentieth Century Impressions of Argentina. Its history, people, commerce, industries, and resources. Director-in-Chief: Reginald Lloyd, London, 1911, Lloyd's Greater Britain Publishing Co.
12 Found in the museum at Gaiman.